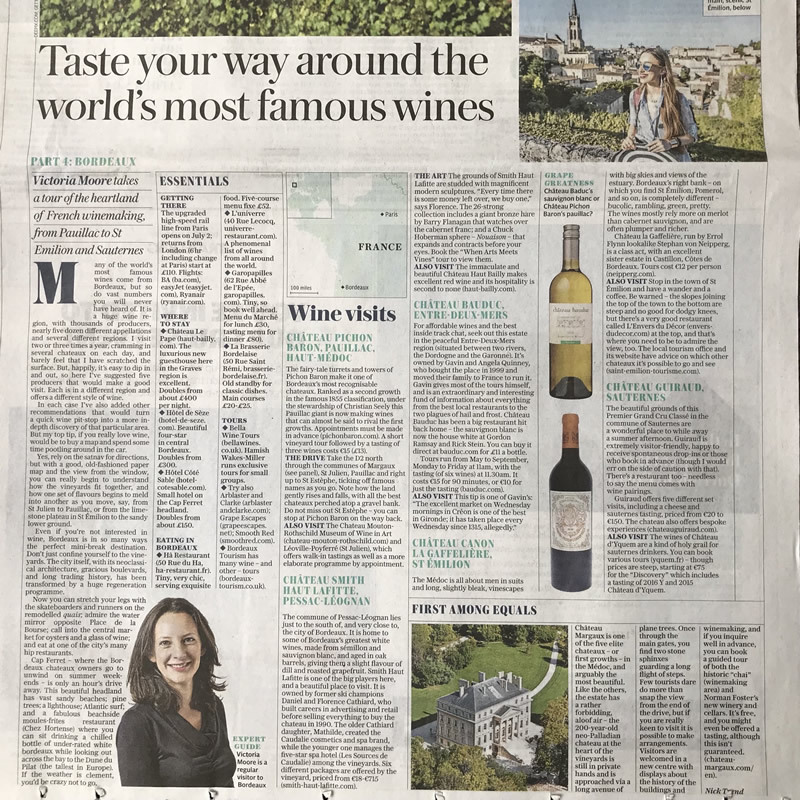 The Telegraph’s wine critic, Victoria Moore, recommended Bauduc as a Château to visit if travelling to Bordeaux (2 June issue). “For affordable wines and the best inside chat, seek out this estate in the peaceful Entre Deux Mers region (situated between two rivers, the Dordogne and the Garonne). It’s owned by Gavin and Angela Quinney, who bought the place in 1999 and moved their family to France to run it. Gavin gives most of the tours himself, and is an extraordinary and interesting find of information about everything from the best local restaurants to the two plagues of hail and frost. Château Bauduc has been a big restaurant hit back home - the sauvignon blanc is now the house white at Gordon Ramsay and Rick Stein. You can buy it direct at Bauduc.com for £11 a bottle. Tours run from May to September, Monday to Friday at 11am, with the tasting (of six wines) at 11.30am. It costs €15 for 90 minutes, or €10 just for the tasting (Bauduc.com). 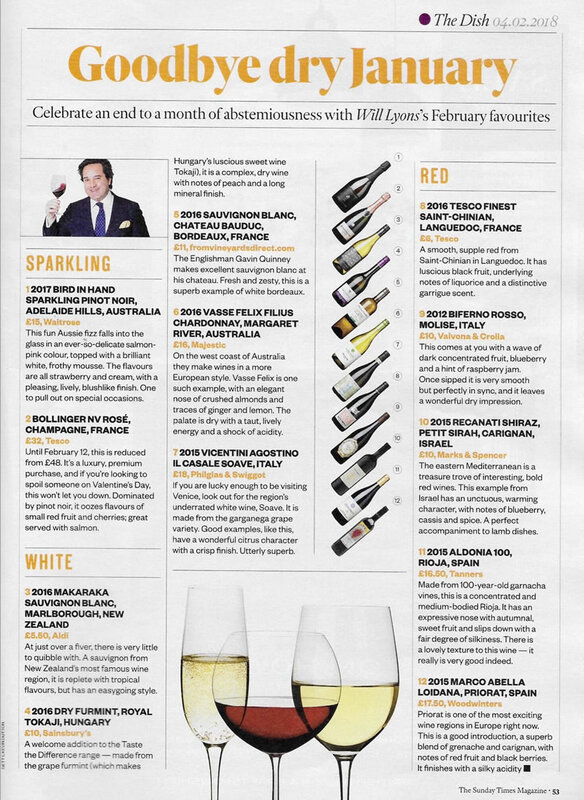 Will Lyons, The Sunday Times wine critic, included Bauduc in his selection of favourites for beating the dry January blues. "The Englishman Gavin Quinney makes excellent sauvignon blanc at his chateau. Fresh and zesty, this is a superb example of white Bordeaux." 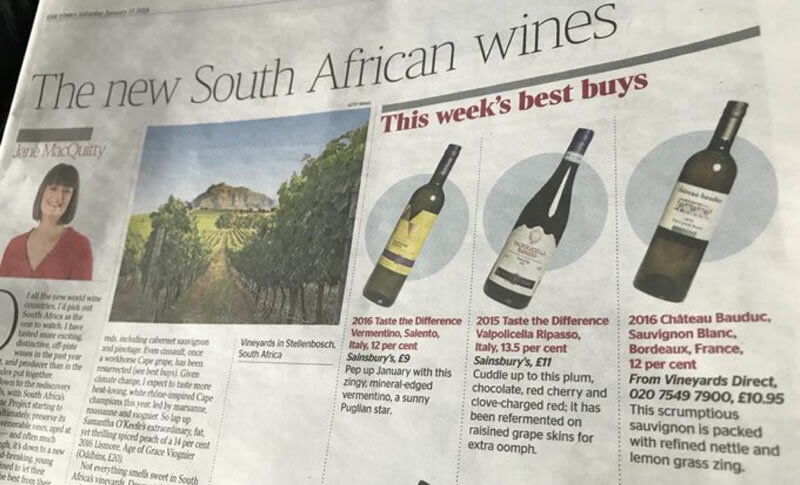 Chateau Bauduc Sauvignon Blanc was included in Jane MacQuitty’s Best Buys in The Times, on 13 January 2018. “This scrumptious Sauvignon is packed with refined nettle and lemon grass zing”, she wrote. 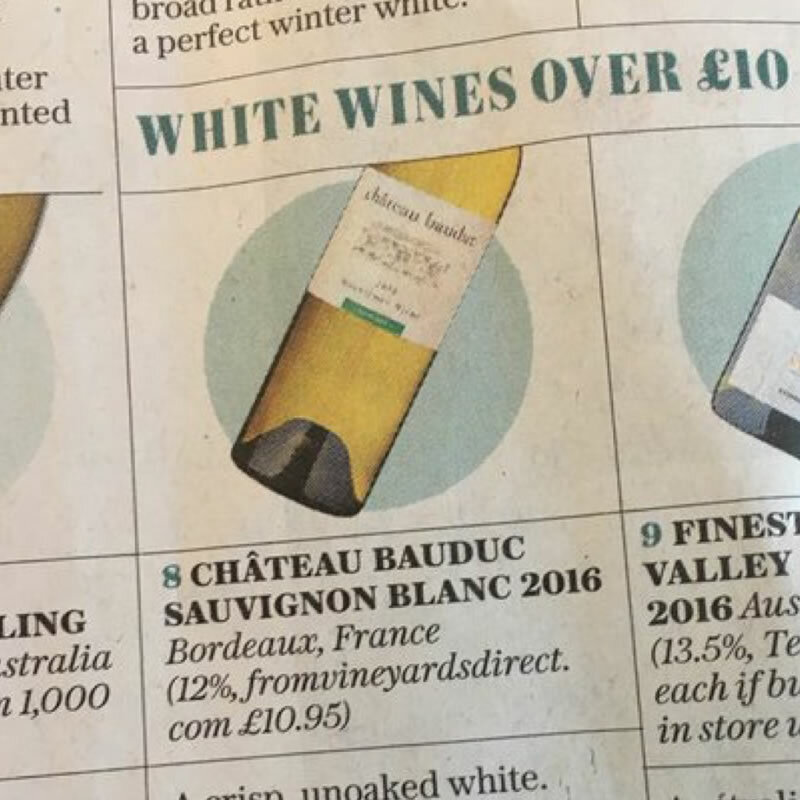 Victoria Moore, the Telegraph Wine critic, chose our Sauvignon Blanc 2016 as one of her 60 best wines for Christmas in the competitive ‘Whites over £10’ category. Chateau Bauduc, Bordeaux Blanc: “The classic unoaked Bordeaux white. Always difficult to suggest bottles from people that you know well, but the British Quinney family has lived in the Créon region of Entre deux Mers since 1999, and make a fresh, understated and extremely juicy white wine that matches well with food. 'Gavin and Angela Quinney have been running this property… since Gavin went mad and bought it after a rush of blood to the head. They sell much of their wine direct - a wise alternative to being entangled in the middle-man-heavy conventional Bordeaux trade. 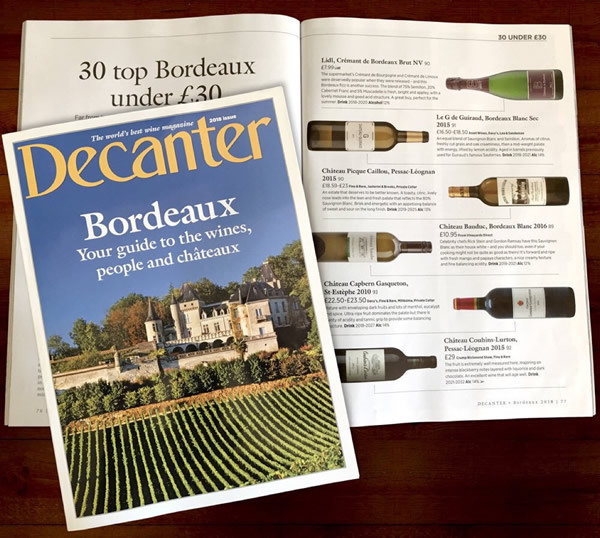 'Another Englishman who has been successful at building a network of supporters is Gavin Quinney, who makes wine in the Entre-Deux-Mers region of Bordeaux. His beautifully crisp white is proudly on the menu at both Gordon Ramsay and Rick Stein – restaurant listings have become an important kudos and authority marker for the producer managing his own sales. ‘Quinney’s lively newsletter goes out to 4,600 people – “I prune it because I’m vain,” he says (I think he means he only wants to write it for those who want to read it). “Also the charge for more than 5,000 is a few more bob.” He sells 80 per cent of his wine directly in the UK, three-quarters of it in private sales and the remainder straight to restaurants. 85% Merlot, 15% Cabernet Sauvignon. Subtle meatiness on the nose, firm and dense on the palate. Really tasty and savoury. Deserves proper ageing - has the purity and substance to last. Drink 2016-2023, 17/20. Lovely viscosity and mouthfeel – there’s so much texture to enjoy here. Flavours are as expected but well controlled, more like yellow citrus than green herbs. Drink 2015-2017, 16.5/20. Hail-affected vintage. Certainly greener than the 2014, but there is good balance – bright acid, fresh balance and no dilution. The flavour profile illustrates how hail impacts on ripeness. Drink 2014-2016, 16/20. 83% Sauvignon Blanc, 17% Smillon. Toasty, expressive, plenty of fresh citric attack still in force then there’s a lovely range of grapefruit and honeycomb flavour on the palate. Long finish. This is really super stuff, and vindicates a good vintage that has aged well under screwcap. Drink 2005-2018, 17/20. 'Bauduc Blanc is the Holy Grail for those of you who can't get the pot pourri and fruit salad notes out of your olfactory system left behind by chemistry set, bulk-bottled Sauvignon. It is classy, elegant, nerve-tingling and, dare I say it, what we should all taste to remind us what Sauvignon Blanc should be like!' Matthew Jukes, The Week and Money Week. 'Gavin Quinney enjoyed a high-flying career in London before deciding he wanted to make wine as well as drink it. In 1999 he bought this handsome property just outside Créon, and moved here with his family. They have become familiar to British newspaper readers, as whenever an editor wants to run a story on the joys/miseries of being British residents in France, a photograph of the Quinneys duly accompanies the article. 'The vineyards surround the château in a single block, and although the wines qualify as Entre-Deux-Mers, the Bordeaux appellations are preferred for both white and red. The soils are varied, with lots of slopes of gravelly clay over an outcrop of limestone. On the plateau, sandy clay sits alongside a large gravel mound. No sooner had Quinney arrived at Bauduc than he replanted half the vineyard to a density of up to 6,600 vines per hectare to improve quality. He makes a range of wines under numerous appellations. The Bordeaux Sec is nearly all Sauvignon Blanc and vinified in tanks after skin contact. In contrast a barrel-fermented wine called Les Trois Hectares is sourced from a three-hectare parcel of mostly Sémillon planted from 1947 onwards. A rosé is made in a dry style from Merlot and Cabernet Sauvignon. 'Gavin’s start at Château Bauduc may have had a somewhat chaotic air to it, but there is no doubt in my mind that he and wife Angela have made a great success of Gavin’s surprise purchase. Today this is a model estate for Bordeaux, the white wines clean cut and vibrant, the reds increasingly good. 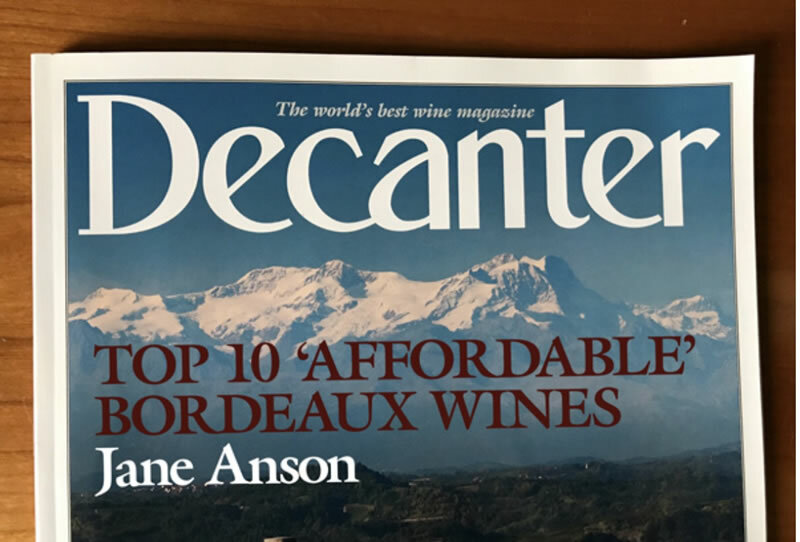 And yet they remain affordable, prices no doubt dampened by the absence of a grand appellation; we are in generic Bordeaux and Entre-Deux-Mers territory here. 'It is no surprise that they have garnered a loyal following, the wines listed by famous restaurateurs, and those not snapped up by Gordon Ramsay and the like sell out via Gavin’s online direct mail-order business, largely to a UK clientele but also much further afield. 'There is pleasure to be had here whatever the colour. The whites remain particularly impressive, sufficiently so for the wines to be listed as the house white by Gordon Ramsay, and they have held this position on the wine list there for many years now. The rosé and red wines are also listed. Another to fall under the spell of Château Bauduc is Rick Stein, who again lists all three colours, again as the house wines. Surely two celebrity chefs can't be wrong?